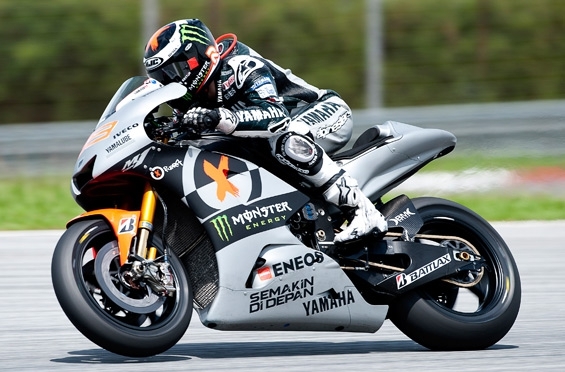 Reigning Champion Jorge Lorenzo topped the timesheets for the first time in an official IRTA test in 2013 with a 2m 0.282s lap on his Yamaha M1, 0.369s ahead of Repsol Honda rider, Dani Pedrosa. Up til now the Spaniard had been sitting firmly in second place on the time sheets, throughout the first Sepang test a few weeks ago, and indeed yesterday where he was two tenths slower than his pint size compatriot. Today’s time however, is still 0.182s off Pedrosa’s fastest time set in the first test. Behind the two Spaniards was Britain’s Cal Crutchlow, who set a fastest time of 2m 0.907s, over 6 tenths off Lorenzo’s time, this is almost one and a half seconds quicker than the Tech 3 rider managed yesterday. He was followed very closely by rookie Marc Marquez, less than a tenth behind the Brit with a 2m 0.992s lap. Outside of the 2m 00s barrier was Valentino Rossi in 5th, the Italian was just 0.073s behind Marquez, improving on yesterday’s time by nearly a second. Today was a better day for the Italian, after being hampered by electrical problems on day one. He was just ahead of Go&Fun Gresini rider, Alvaro Bautista, who improved on his overall time by well over a second. Less than 3 tenths behind the Gresini rider sits German LCR Honda rider, Stefan Bradl, the first rider outside the “one second off the top” zone. Similarly to yesterday, both the main factory Ducati riders lie in 8th and 9th place, this time with Hayden in 8th and Dovi in 9th. Both riders are hovering around 1.5s off Lorenzo’s time, an improvement for Nicky, but not so much progression for his team mate, Dovi. Bradley Smith continued to improve today ending up in 10th, 1.741s off Lorenzo’s time, but one and half seconds improvement on his lap from day one. Behind him in 11th was Pramac rider Andrea Iannone. The Italian has improved again, in closing the gap to the front on his Desmosedici. Aleix Espargaro finished in 12th and continued to impress on his Aspar ART CRT…. he sits nearly half a second ahead of the second CRT bike of Hector Barbera, who lies in 16th, behind a gaggle of factory test riders. Ben Spies is 17th on his Pramac Ducati, the American will no doubt be having continuing problems with his injured shoulder, whilst getting to grips with the difficult Desmosedici. He was closely followed by the second of the Aspar CRT bikes and Randy de Puniet. Next Next post: A "pretty good day" all round for Yamaha in Sepang.